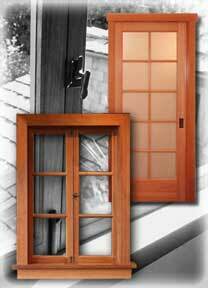 Our goal is to provide an environment that encourages creative door and window solutions. By providing accurate and relevant information we empower our customers to make good decisions and achieve their project goals. By incorporating the creation of beautiful, long lasting and intelligent designs, we promote harmony with the built and natural environment. Thomas Nedelsky, founder and current owner, first opened the doors of a small wood shop on the central coast of California in July of 1988. Originally named Nedelsky Millwork, the company has grown modestly in both size and scope. Thomas has a Bachelor of Arts degree from Hampshire College and has assembled a talented and intelligent team. Santa Cruz Millwork currently provides window and door solutions to contractors, architects and owner-builders or the central coast. Smaller projects, such as entryways, can be shipped nation-wide. Santa Cruz Millwork is looking forward to working with you! Santa Cruz Millwork is wonderful... They're great problem solvers and so easy to work with! We were concerned about using environmentally friendly materials in our new construction project...Santa Cruz Millwork was so knowledgeable about sensibly harvested lumber and they do such excellent work- they were great to work with. Santa Cruz Millwork was so accommodating, they answered all my questions and were very helpful throughout the entire project. Working with Santa Cruz Millwork was effortless...They do top-notch work and everyone was so pleasant... They always did what they said they would, when they said they would!